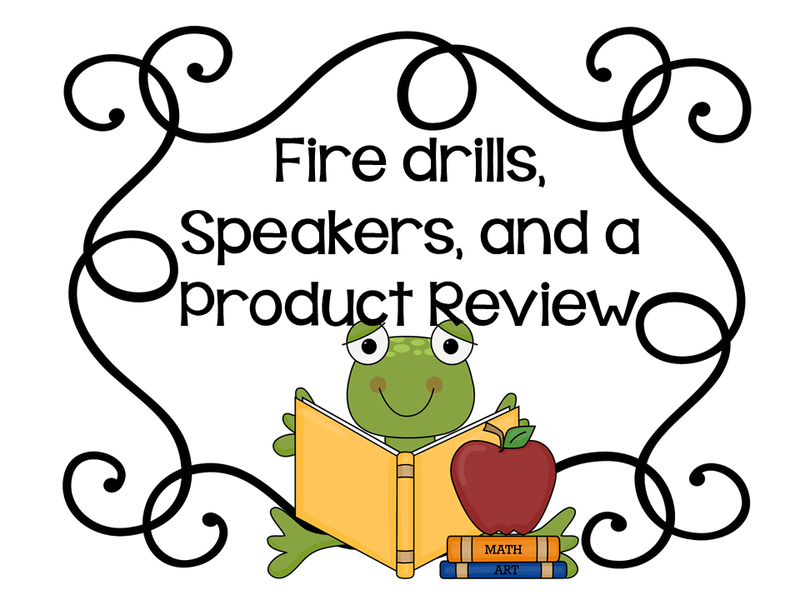 We had two fire drills (not on purpose) this past week and it made me wonder how other schools practice emergency drills. 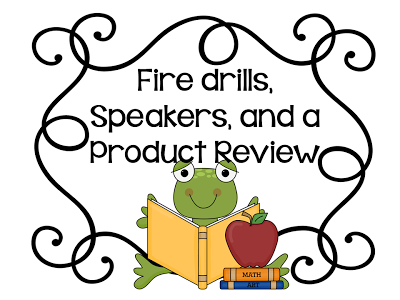 For fire drills the alarm goes off (duh) and the kids know to drop what they are doing get up from their seats and in an orderly fashion go down the hall, down the stairs, down the ramp and outside. I am always the last person out. The first student (or the first to remember) takes our "crisis bag" with them and holds it until the entire class is outside safe. Once outside I take the bag and hand a sign (laminated paper) to the first person to hold up. Green means everyone is accounted for, Red means someone is missing (they may have been in the library or with a specialist, etc. ), and Yellow means we have an extra child with us (like if someone was in the restroom and comes out with us. We have almost 900 students (sounds like a lot??? Naaah, we use to have 1400!!!) at our PreK- 5th grade and our school is two stories. How do you guys handle emergency drills in your school? In fourth grade we study Native Americans from Texas. 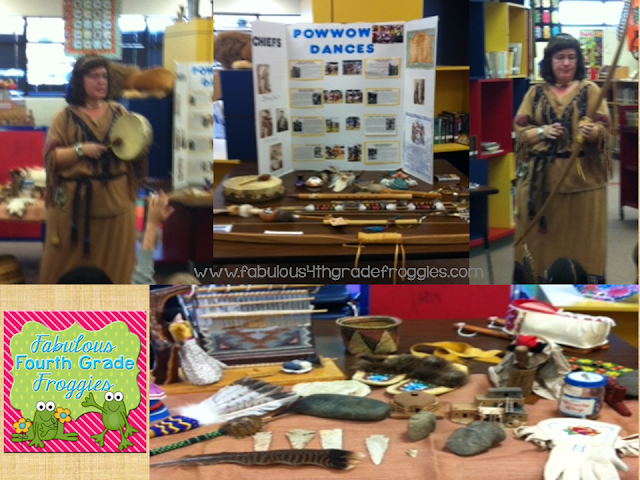 We were super lucky to have one of our Special Education teachers share her culture with us. She did a great presentation and the kids loved making connections to what they learned to what she shared with us. Here are some pics from Friday's event. A super sweet gal from Shoplet.com asked me if I would be interested in trying a product and reviewing it... Suprise, I said yes and I am glad I did. 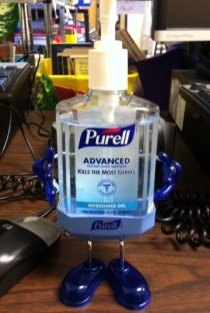 I received some awesome gojo products... a Purell Pal Instant Hand Sanitizer Desktop Dispenser, a Purell Portable Size Hand Sanitizer Jelly Wrap, a Purell ADX7 Dispenser, and the Purell Advanced Non-Aerosol Foam Hand Sanitizer that goes in it. All were super cool and super useful but my absolute fave is the desktop dispenser! As you see in the picture it's absolutely adorable! My kids LOVE LOVE LOVE it! 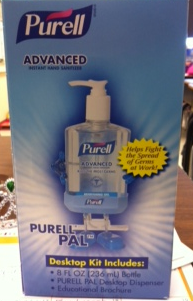 At first I selfishly had it on my desk and kept it for myself to use but then I decided to share. The desktop dispenser now sits in between a couple of student computers. 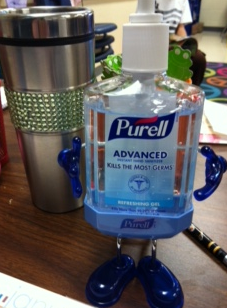 The kids know to get a squirt before using the computers so hopefully no germs are spreading on our keyboards. I am thinking of purchasing a couple of more to use as my bathroom passes that I blogged about sometime this summer, I am sure the kids would love me for it! The crisis bag is a GREAT idea! We photocopy our class lists onto red and green paper and put them in a page protector kept by our fire exit. Same routine for the red and green - but I never thought to add it to a bag full of things we (hopefully never) need. At my school every classroom has a backpack and basically does the same thing you mentioned- get out and hold up a card. Last year we were given a bucket that also has stuff inside. It also doubles as a toilet (complete with a toilet seat) if we were ever stuck in our classroom in a shelter in place.. Somehow I can't imagine ripping down my fabric bulletin boards to create privacy for a restroom... Hopefully we will never need it. I love the idea of the crisis bag. 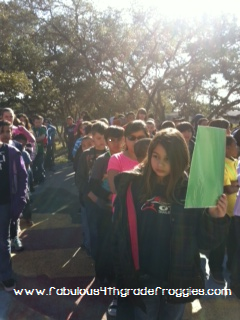 We had to evacuate our building in December with over 500 students. There was no fire, but the smell was awful. It was during the lunch hour, so students weren't with teachers. It was amazing how orderly things went when we relocated to the high school gymnasium. Students had left lunches on tables in the elementary cafeteria and had to be fed for free. The crisis bags would have been helpful for the little ones. I would recommend a video or books that can be read aloud. We turned a wall into a huge screen, and students enjoyed a video. We have a crises bag too, but it doesn't include anything for the kids to do. That would have come in handy two weeks ago when the fire alarm went off for real. Of course we all thought it was a drill so boone took their coats. We thought we would be outside for a couple of minutes, but it ended up being closer to 20. (There was some kind of hot water leak in the cafeteria.) The kids were restless and we were all freezing. Having something for them to do would have been helpful. Thanks for sharing. I love that idea of the crisis bag. I'm going to share it with my faculty. We just have a class list, red/green card and that's about it. We are just starting to talk about security around our school. The bucket thing...never thought of that! I absolutely LOVE the crisis bag idea! Its always better to be super organized before something like this happens, and then realize how helpful it is in the moment! Thanks for the amazing idea!